In August 2015 and May 2016, the Allegheny County Controller’s office reported on the Allegheny County Health Department’s (“ACHD”) compliance with regulations governing the timely issuance and renewal of operating permits for sources of air pollution in Allegheny County. The 2015 report discussed five major sources in the county that had never been issued operating permits. The 2016 report highlighted a backlog of applications for renewals of expired operating permits for major and other sources. GASP routinely collects and reviews operating permits for major sources in Allegheny County and surrounding areas, so we checked whether ACHD had made progress in issuing and renewing permits to the sources identified in the Controller’s reports. For purposes of air quality permitting, major sources in most of the counties surrounding Allegheny County are under the jurisdiction of the Pennsylvania Department of Environmental Protection’s (“DEP”) Southwest Regional Office, so we also looked at whether applications to issue and renew operating permits for major sources in those areas were similarly backlogged. This post compares how ACHD and the DEP’s Southwest Regional Office are performing their permitting functions with respect to major sources of air pollution. But first, some background on the legal requirements that apply to the agencies. Major sources of air pollution are required to obtain operating permits from state or local permitting programs. Because these programs must comply with requirements that are imposed by Title V of the Clean Air Act, the operating permits that they issue to major sources are often called “Title V Operating Permits.” The Clean Air Act requires that state and local Title V permitting programs be self-financed, meaning a program must impose fees on the Title V sources under its jurisdiction that are sufficient to fund its operations. A major source’s Title V Operating Permit must include all applicable federal, state, and local air pollution law requirements. The Title V operating permit requirement improves major sources’ compliance with air pollution laws by eliminating confusion regarding which requirements apply to any particular source and by mandating that operators of such sources monitor and report their compliance with all such requirements. Although sources are required to comply with new applicable regulations that become effective after their Title V Operating Permits are issued, a source might avoid reporting on its compliance with such regulations until its permit is revised to include them. Accordingly, it is important for permitting programs to process renewal applications efficiently and keep permits up to date. Under ACHD and DEP regulations, an operating permit generally is valid for five years from the date it is issued. Between eighteen and six months before an operating permit expires, the source’s owner or operator must submit an application for a renewal operating permit to ACHD or DEP if the source is to be authorized to continue operations after the expiration of its current operating permit. The regulations require that the agencies act on an application for a renewal permit within eighteen months of the submission of a complete application. First, the 2015 Allegheny County Controller’s report noted that there were five major sources in Allegheny County that had never been issued Title V Operating Permits, despite the sources having submitted applications in the 1990s. Since August 2015, ACHD has issued Title V Operating Permits to three of those sources and has indicated to GASP that they plan to issue a Title V Operating Permit to another of the sources by the end of September. The last of the five sources operates subject to a federal court order that, at least for the time being, effectively precludes ACHD from issuing a Title V Operating Permit. By way of comparison, there are no major sources of air pollution subject to the jurisdiction of DEP’s Southwest Region that have never been issued a Title V Operating Permit. These nine sites with backlogged renewal permit applications create a significant amount of pollution. In the aggregate, the sites’ emissions of the five pollutants for which emissions inventory data was available from ACHD for 2015, namely nitrogen oxide (“NOx”), sulfur oxide (“SOx”), volatile organic chemicals (“VOCs”), particulate matter (“PM10”), and fine particulate matter (“PM2.5”), exceeded 1,500 tons in 2015. One of the sites, U.S. Steel’s Irvin Works, had over 927 tons of emissions in 2015, making it the fourth largest stationary source of air pollution in Allegheny County. And while the stale permits sit, emissions could be increasing. The Environmental Integrity Project, working with GASP, analyzed emissions data for these sources and found that some facilities with expired Title V permits reported significantly higher emissions of regulated toxic pollutants than they did five years ago to EPA’s Toxic Release Inventory (“TRI”) database. One of these facilities, Ranbar Electrical Materials in Harrison City, nearly doubled its amount of air toxics reported to the TRI database since its last Title V expired in 2010, with the pollutants reported in the highest amounts in 2015 being xylene, methyl isobutyl ketone, and ethyl benzene, a possible human carcinogen. It is unacceptable that the agencies responsible for permitting major sources of air pollution in our area have allowed the operating permits for one-third of such sources to expire without acting on their pending renewal applications in a timely manner, especially in light of the requirement that major source permitting programs are to be self-financed. 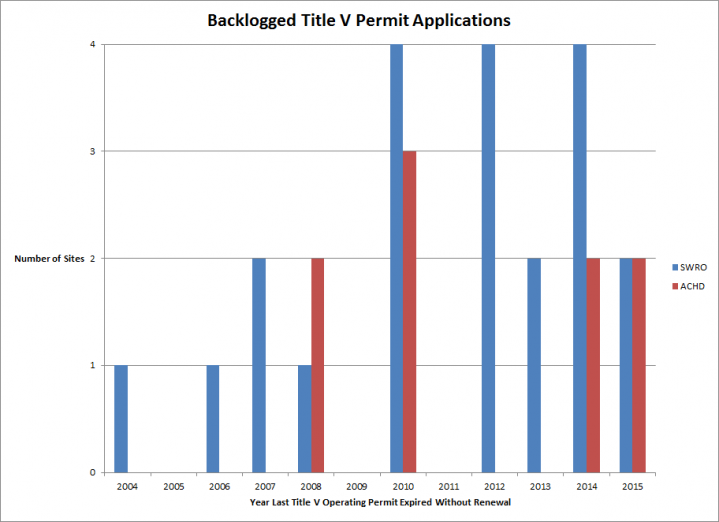 Both ACHD and DEP need to take immediate steps–including raising the fees that they impose on Title V sources–to eliminate their backlogs of applications for Title V Operating Permit renewals and prevent such backlogs from recurring. Posted September 28th, 2016 by Jamin in Blog.